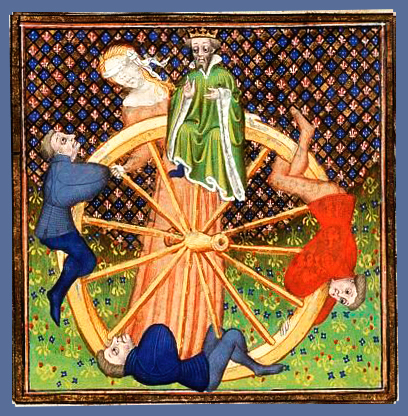 Our idea that there is a cycle to life has been expressed in many ways, ranging from the funereal “ashes to ashes, dust to dust” to the more colloquial “what goes around, comes around.” This view is by no means recent, and seen to the medieval mind, fate was seen as a tremendous wheel, rotating through joys and sorrows, godliness and sin. Carl Orff uses this ‘wheel of fortune’ motif as the basis for one of his best known and most frequently performed works, Carmina Burana of 1937. In 1803, a collection of medieval poetry was rediscovered in the Benediktbeuren Catholic monastery in upper Bavaria. The manuscript had been locked away for more than 500 years, in a cabinet also used to store Protestant and other ‘forbidden’ works. The poetry had been suppressed partly because of its secular nature, and partly because of its authors: the 200 poems were the work of vagabond poets known as goliards.